When Philadelphia patients need orthodontic work, they may want to speak to a dental professional about the benefits of using Invisalign. Misalignment of teeth, is a common issue that can be improved with the use of orthodontics. However, metal brackets and wires often turn patients off to the idea of straightening their smiles. This type of treatment is not the most desirable. However, with Invisalign orthodontics, patients can choose an alternative that is discreet and affordable. Using Invisalign is one way for patients to improve the alignment of their smile without brackets and wires. 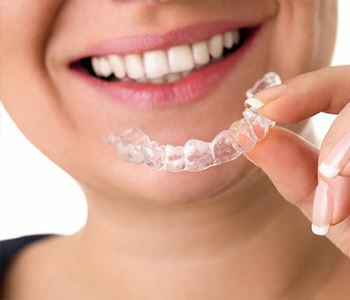 This treatment utilizes clear aligner trays that are custom-made using digitized impressions. An entire series of trays are fabricated for the patient. Every two weeks, patients switch to the next tray in the series. These trays are worn day and night and only removed for care of the smile and eating. When patients comply with treatment, they can enjoy a more beautiful smile in approximately a year or less, depending on the severity of their misalignment. Our team will give patients an estimate of how long it will take to improve their smiles. Fortunately, most cases are rather short since Invisalign is intended for patients with mild to moderate misalignment. Invisalign is affordable, fast, and effective, while also allowing patients to improve their smile without the embarrassment of traditional braces. Are you interested in learning more about dental work to enhance your smile? Do you believe Invisalign orthodontics is right for you? Dr. David Spilkia and his professional staff are here to help. Contact us today at (267) 463-2777 and schedule a visit to find out more. We are conveniently located off Frankford and Cottman Avenues at 7052-56 Frankford Avenue and are currently accepting new patients into our state-of-the-art practice. Appointments and consultations may be conveniently requested online or by calling us at (267) 463-2777. Our office is located at 7052-56 Frankford Avenue in Philadelphia.